Dr. Harpreet S. Dhillon was born and raised in Vancouver, BC. He completed his genetics degree at the University of British Columbia and went on to the New York University College of Dentistry, graduating in 2006 with an honours degree in pediatrics. He practiced dentistry in Washington State, USA, from 2006–2009 and then moved to Edmonton, Alberta, where he practiced from 2009–2014. He began at Lifestyle Dental Care in 2016 and has been providing comprehensive care to his patients ever since. Dr. Dhillon is a member of many highly regarded medical and professional organizations, including the BC Dental Association, the Academy of General Dentistry, the American Dental Association, the Canadian Dental Association, the American Academy of Implant Dentistry, and the International Team of Implantology. He is in good standing with the BC College of Dental Surgeons, the Alberta Dental Association and College, and the Washington State Department of Health. He has also been an Invisalign®-certified practitioner since 2006. Dr. Dhillon realizes the importance of continually educating himself and improving his skills. He is apart of local and American orthodontic study clubs. He also is a Certified Botox provider. Having completed his training at the Pacific Training Institute of Facial Aesthetics, he is able to provide cosmetic and therapeutic botox to his patients. Combining dental expertise with compassion and personalized care, Dr. Dhillon provides Surrey and Delta families with the most advanced dentistry available. Patients of all ages receive the gentle care and personalized dental plans that meet their unique needs, and they are educated on their specific dental concerns and the necessary procedures in easy-to-understand terms. 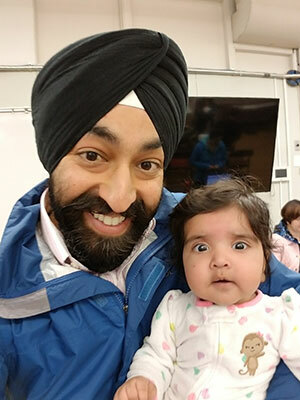 Outside of the office, Dr. Dhillon loves spending time with his wife, daughter and their dog. He enjoys running, going to the gym, and watching movies.